Photo: Frank J. Weess House, ca. 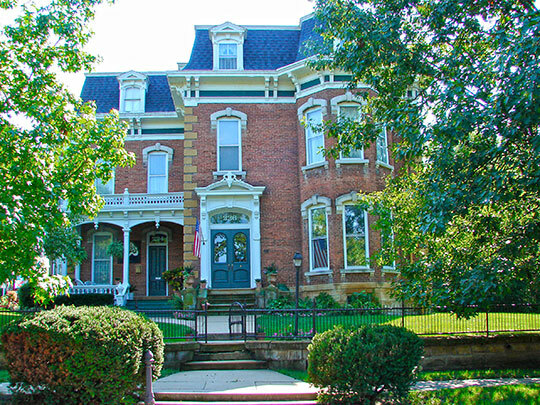 1881, 224-226 Morgan Street, Keokuk, IA. Listed on the National Register of Historic Places in 1978. Photographed by User:Smallbones (own work), 2010, [cc-by-1.0 (creativecommons.org/publicdomain/zero/1.0/deed.en)], via Wikimedia Commons, accessed July, 2015. Lee County is unique in that it has two county seats — Fort Madison and Keokuk. The county courthouse in Fort Madison is located at 701 Avenue F, Fort Madison, IA 00000; phone: 319-372-3523. The county courthouse in Keokuk is located at 25 North 7th Street, Keokuk, IA 52632; phone: 319-524-2433. Keokuk is often referred to as the South Lee county seat.